. @DisneyAnimals: Disney Conservation Fund Announces 2016 #DisneyConservationHeroes, bit.ly/2eVWQwo. The Disney Conservation Fund (DCF) supports organizations working all over the world, through its “Reverse the Decline, Increase the Time” initiative, to reverse the decline of threatened species and increase the time kids and families spend in nature. The fund honors conservationists who have gone above and beyond, demonstrating passion, courage, and tenacity in tackling some of the biggest challenges in protecting the planet’s resources. 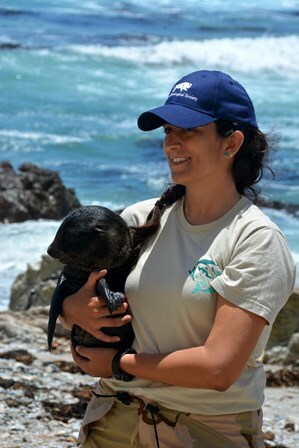 Susana began studying fur seals in the Punta San Juan Marine Protected Area (PSJ) on Peru’s coast as a university student and today leads a comprehensive, year-round program to research and monitor Peru’s coastal wildlife and change community attitudes about conservation. Her research has led to a better understanding of the health and movements of PSJ’s pinnipeds and birds. Her team’s outreach and education work has created local advocates for nature, engaged community members as volunteers and citizen scientists, and raised awareness among Peruvian government and universities to inform decisions and protect marine wildlife. 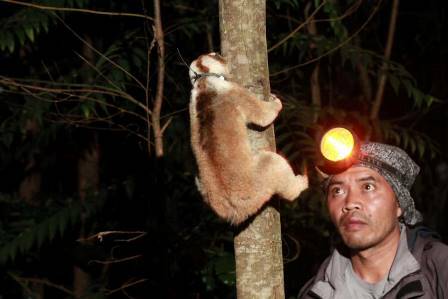 Despite the local taboo that it is bad luck to see a Javan slow loris, Dendi’s passion for the environment inspired him to join the Little Fireface Project team to protect this nocturnal animal in Indonesia. He was soon captivated by slow lorises and poured himself into research and conservation activities to protect them. Dendi, now the team’s Project Manager, started weekly Nature Club meetings to teach adults and children about this Critically Endangered species and the environment in a fun, engaging way. Dendi also initiated the design and construction of a unique, tuition-free school where he has integrated the Nature Club into the curriculum, and helped ensure the school’s national accreditation by the Indonesian government. 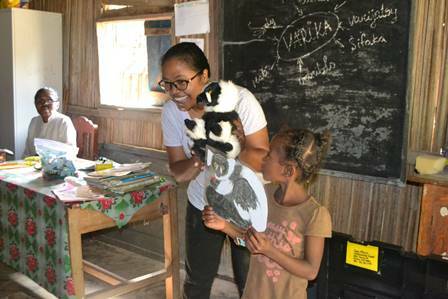 Lalaina joined the Conservation Fusion team in 2010 as a translator and has since traveled across Madagascar to educate people of all ages about the importance of their local forests and wildlife – especially the many species of lemur, which can be found only in Madagascar. Beyond her work with children’s education programs, Lalaina initiated a “village elder” workshop to ensure community adults were also engaged in learning about forest restoration and new agricultural techniques. She has now spearheaded education initiatives, teacher training workshops, follow-up interviews and reports across multiple villages. She approaches all of her work with a positive attitude and a smile, and challenges herself and everyone around her to be the best they can be. This team of 70 courageous people is directly responsible for the current growth and stability of Rwanda’s critically endangered mountain gorillas. Working in teams to protect specific groups of gorillas, they’ve had dangerous close calls related to the extreme elements and landscape, as well as direct run-ins with poachers. The trackers can tell each gorilla apart and know their histories and behaviors well. Collectively the group spends 365 days 110,000 hours per year protecting and monitoring the gorillas, supporting scientific research, and helping to maintain the biodiversity of the forest, as they have done for nearly 50 years. 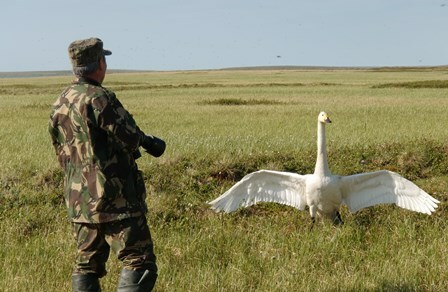 Each summer and fall Sergei Sleptsov and Ivan Danilov endure Russia’s harsh tundra conditions – coping with daily temperature fluctuations of 50 degrees or more, clouds of mosquitos and gnats, and rain and snow – to conduct vital research on the critically endangered Siberian crane. Their field region covers two million acres and often they are only able to reach their study sites on foot, carrying heavy supplies and gear. Sergei has provided invaluable data on cranes, participating in many international field expeditions to monitor their migration. He was even one of the first scientists who was able to capture Siberian crane chicks in order to band them. In his long career, Ivan has led efforts to establish protected areas for cranes and collected valuable scientific data used to justify protected area status in key crane breeding areas. 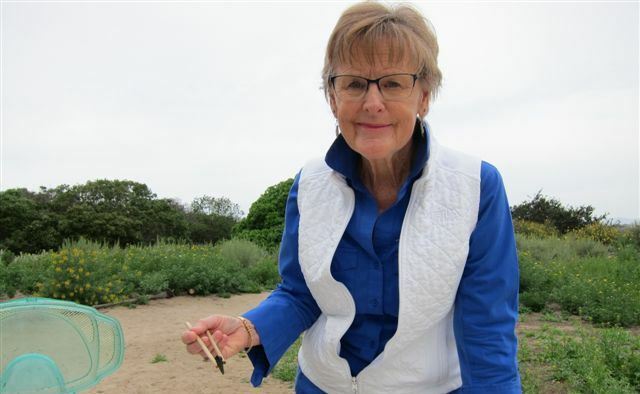 After retiring from her 30 year teaching career, Emily became a volunteer with L.A. Audubon at the Ballona Wetlands – a place she used to bring her students on field trips, and where she felt an immediate connection with the land. As a volunteer Emily educates students from underserved communities in the L.A. area about the importance of wetlands as habitat as well as the environmental services they provide. With her deep knowledge of the wetland ecosystem and extensive teaching experience she is able to effectively communicate these scientific concepts to students and help them appreciate birds, lizards, aquatic creatures and all the wonders of the wetlands. “Denny” became an avid birder and conservationist later in life, after a career as a banker. She began volunteering to protect birds in The Bahamas, and soon became a local champion for the endangered piping plover. 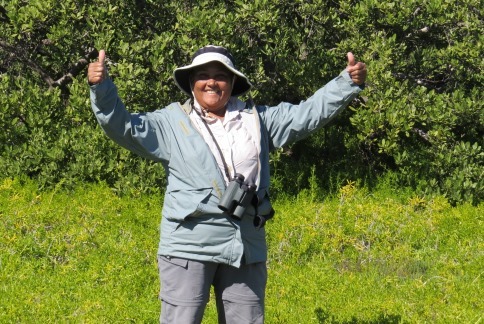 She has accompanied biologists to some of the most remote corners of The Bahamas to census bird populations, contributing to work that was instrumental in the creation of a new national park in The Bahamas – Joulter Cays National Park. Denny’s passion for nature and birds helps her change people’s lives, from sharing her knowledge with hundreds of school children during summer camps to delivering trainings for adult bird and nature tour guides, and inspiring all to become nature lovers. Initially employed in 2001 by the North Luangwa Conservation Project in Zambia as a casual laborer, it was quickly apparent that Sylvester had a natural ability to engage children. 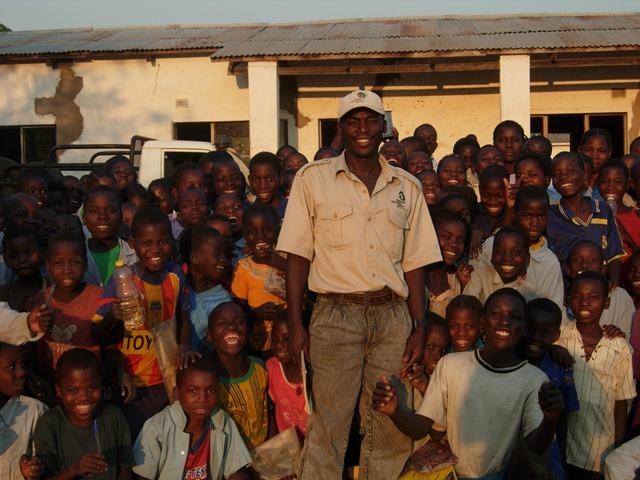 By 2003, he became responsible for educating visiting school and community groups about black rhinos and was appointed Conservation Education Program Officer in 2004. Without formal training or supervision, Sylvester developed his own effective teaching style and expanded the team’s education program from eight schools to 21. Sylvester also works with adults in the local communities, raising awareness of black rhino conservation among roughly 5,000 people each year. Through his determination and professional achievements, Sylvester serves as an inspiration to his community and the next generation, who can see through his example that there are tangible benefits to supporting wildlife conservation. 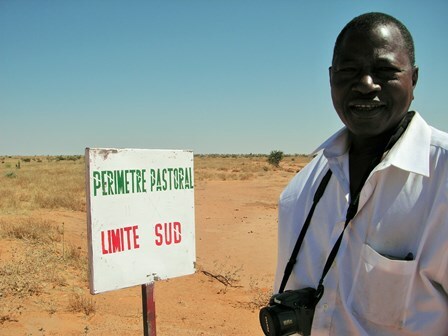 Nomba works in Mali to protect elephants with the understanding that the threats to elephants are the same as the threats to the livelihoods of local people. Nomba brought diverse groups of people together to learn about their perceptions and attitudes towards elephants, and overcame traditional ethnic rivalries to achieve the common goal of elephant conservation through wise resource management that protects and restores habitats and benefits local people. Nomba continued with this work to protect elephants and assist local villagers even when the area was threatened by multiple armed conflicts. His deep relationships with local communities are helping to build social cohesion despite ongoing insecurity, while reducing poaching and protecting the elephants – providing a model for other regions of Mali and West Africa in community engagement for conservation. In 2010, Joko, an aspiring conservationist making a living raising chickens, organized a local group of volunteers in Sumatra, Indonesia, to protect the nesting beaches of a remnant population of painted terrapins, a species now ranked critically endangered due to over-harvesting of eggs and removal of adult females from the populations. Joko turned this project into an organization, dedicated to protecting turtles and raising hatchlings, which has become internationally recognized and supported. 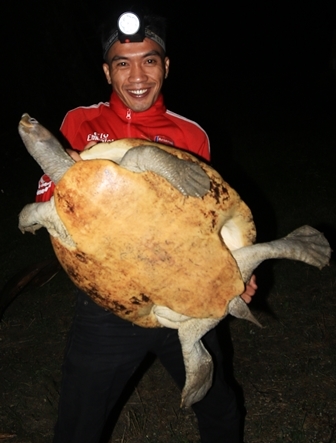 Joko, a self-taught turtle biologist, is so dedicated to protecting terrapins that he spends countless hours away from home, camping in remote and dangerous locations to protect terrapin nests. He also works to raise public awareness of the plight of the painted terrapin and has even presented his findings to the government seeking protection for the species. Ten years ago Eusebio was a skilled hunter with no knowledge of conservation living in a remote village deep inside Niassa National Reserve in Mozambique. Today he is a wildlife guardian and local champion for conservation – using his extensive bush skills to track lions in Mozambique and educate communities about the importance of wildlife conservation. Eusebio is a critical member of the Niassa Lion Project team and in charge of monitoring lion and prey density, and assisting communities with human-carnivore conflict. Among communities where few believe in conservation, Eusebio’s local experience, charisma, leadership and increasing conservation experience make him an emerging powerful local voice for conservation. After witnessing the loss of mangroves to development in the river delta near his home, Appa Rao felt compelled to volunteer for a community project which restored approximately 11,000 hectares of mangroves over 5 years. Previously an electrical engineer, Appa Rao is now known as the “Mangrove Man of India,” a name given to him by the Fishing Cat Conservancy. His instrumental role in mangrove restoration is locally recognized in more than 30 towns, and Appa Rao now dedicates his life to mangrove and wildlife conservation. As lead field conservationist for the Fishing Cat Conservancy he has educated people in more than 20 villages about the importance of fishing cats and their mangrove habitats and is working to create community-managed protected areas for fishing cats. Diorene established the first and only ongoing research program to monitor the elusive pygmy sloth, which is found only on a small island off the coast of Panama. Diorene collects crucial population data on this critically endangered species and also studies human disturbance and use of natural resources across the island. Her work requires enduring inhospitable field conditions which require innovative solutions to technology that malfunctions in the wet, salt-laden environment. Managing and conserving the pygmy sloth is a sensitive issue locally, but Diorene works closely with local schools, divers, and fishermen to raise awareness and promote sustainable resource use. What may be most amazing about Diorene is that she’s managed to do all of this important conservation work in her spare time while working as a full-time zoo curator and veterinarian! In the continuing battle to save the Philippine environment, Agricultural Technician Wilson Batislaon has provided critical support by galvanizing and guiding the restoration of 15 hectares of abandoned fishponds to mangrove habitats. He has engaged more than 500 students and teachers, out-of-school youths, government and private sector employees, civil society members and the Coast Guard to plant more than 20,000 mangroves in dozens of sessions since 2009, in close collaboration with ZSL. Wilson has tirelessly worked to raise government funds and to establish regulations to protect mangroves, culminating in the launching of the Katunggan Eco-park in 2014. During her more than 24-year career with Walt Disney World Theme Parks and Resorts, Wendy turned her passion for nature into a tireless dedication to protecting wildlife. The Audubon Center for Birds of Prey in Maitland, Florida, was especially close to Wendy’s heart; she frequently organized Disney VoluntEARS landscaping teams to help spruce up the center. She was honored in 2012 as Florida Audubon Volunteer of the Year. Wendy took her passion for the natural world beyond her professional duties by consulting on environmental projects within Florida and around the world, including Africa, Asia and Latin America working to solve global hunger through sustainable farming. She served on the Florida Department of Agriculture Endangered Species Task Force, as a Director and Treasurer of the Association of Zoological Horticulture, and President of the Florida Aquatic Plant Management Society. Click HERE to view all of the Disney Conservation Fund 2016 Conservation Heroes.